Demonstrate your understanding of the Real Estate Lifecycle. The real estate lifecycle relies on RICS’ and many other professionals. This certification recognises the role that they all perform. RICS, through our qualified professionals, are best placed to advise across the real estate lifecycle from planning and acquisition to construction and occupation. However, there are other significant agents and advisors involved that affect a successful real estate market. 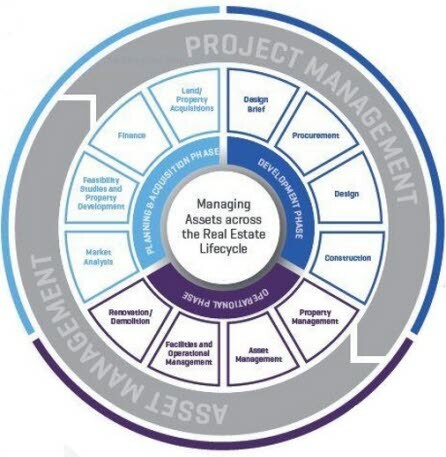 The RICS Real Estate Lifecycle Certification provides a thorough training and assessment programme ensuring individuals understand all functions of the real estate market and the role that RICS, our standards and professionals, perform in the market. Established service providers working within the real estate market that complement, support or rely upon professionals in the land, property and construction industries. The primary functions of these service providers are in corporate (financial and legal), operational (HR and marketing), and statutory (public sector) services. Many financial, legal, HR and marketing professionals are deeply involved in the built environment either working within the industry itself, providing related legal advice, investing or lending, or as clients, suppliers, business associates or colleagues of RICS professionals. These professionals perform an integral role throughout the real estate lifecycle and there is existing demand from these professionals to better understand the real estate sector. Through recognising these individuals and their contribution to the real estate market we can create greater market confidence in real estate and drive greater adoption of the RICS standards and professionalism already recognised in the market. "We are committed to supporting the real estate sector as it works to address the shortfall in the supply of homes and many other important issues. By working with RICS to invest in upskilling our specialist teams across the country, we will be able to provide more informed support to our clients in the sector." Why become RICS Certified in the Real Estate Lifecycle? Gaining certification will provide recognition of an understanding of the real estate market, a knowledge of recognised RICS standards and a commitment to continuing professional development in real estate. On completion of the training, individuals will be assessed by a 75-minute online exam.